The cable connected to the batteries holder and the switch is a Plus. The other cable connected to the batteries holder is a Minus. The second cable connected to the switch is also a Plus. Let's look at a batteries holder from the "bottom" and from the "top". What you can see is that each battery has a plus and a minus. The other important thing is that each battery has a voltage. In this case 1.2V. Check the yellow circle. These are some very special rechargeable batteries with a voltage of 1.2V. Your batteries are probably 1.5V. 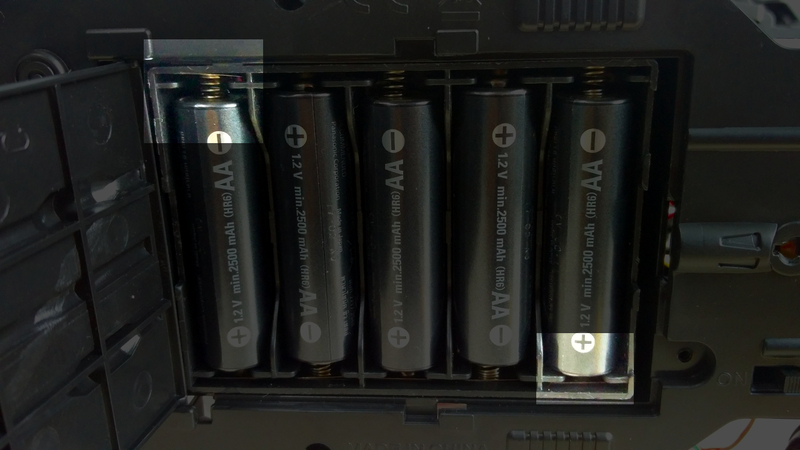 On this batteries holder, the upper left corner is where we have 0V. How do we know? We would tell you in a while. Counting the batteries from left to right the first battery will have a voltage of 0V at the top and 1.2V at the bottom. The second battery will have 1.2V at the bottom and 2.4V at the top. Why? Because this is how the batteries are connected. Check the picture below. 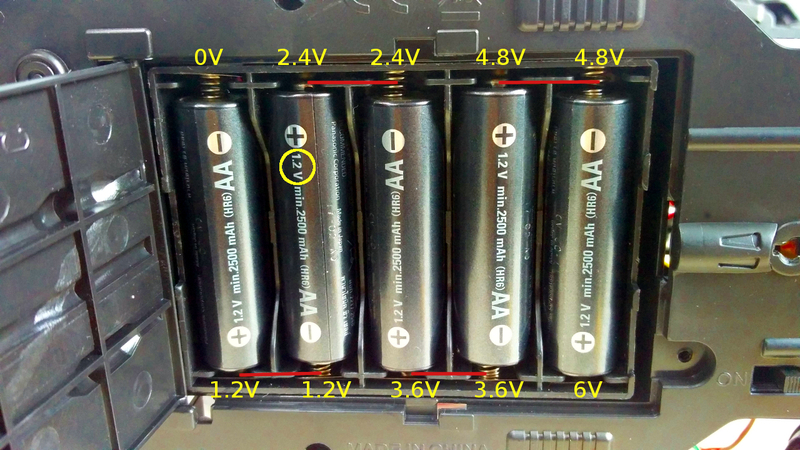 The red lines show the batteries are connected. Because the bottom of the first battery is connected to the bottom of the second we have the same voltage, because it is actually the same point. The same applies for the top of the second battery and the top of the third. They are connected to each other. The other side of the batteries holder looks like the picture on the left. You could see the red cable at the bottom left that is GND (Minus) and the right cable at the top right that is the Plus. How do we know? The plus is connected to the Switch. And we could also look at the other side of the batteries holder - like the picture on the right. and I place the batteries in the batteries holder like this. And now I can close it again and use the screw (you should not lose the screw) to keep the batteries holder closed. When you move to the other side right here you will see that there are 2 cables going out from the batteries holder. This one here and this one here. And both of the cables are white. What's important to understand here is that the cable that is connecting the batteries holder to the switch and you remember that this here was the switch. We gave it a name and we have power over it. We can refer to it, we can change it and use it so this here is the switch and the cable coming from the batteries holder to the switch is the plus of the batteries holder. So, this one here is the minus. And we've correctly marked this with the switch minus or batteries holder minus - this is also the ground. Again, the cable coming and probably we've never seen cars in which this is not the case. Probably there are some cars. If you are with such a car, just get in touch with us so that we can resolve this and we can give you a clue where the minus and plus are. 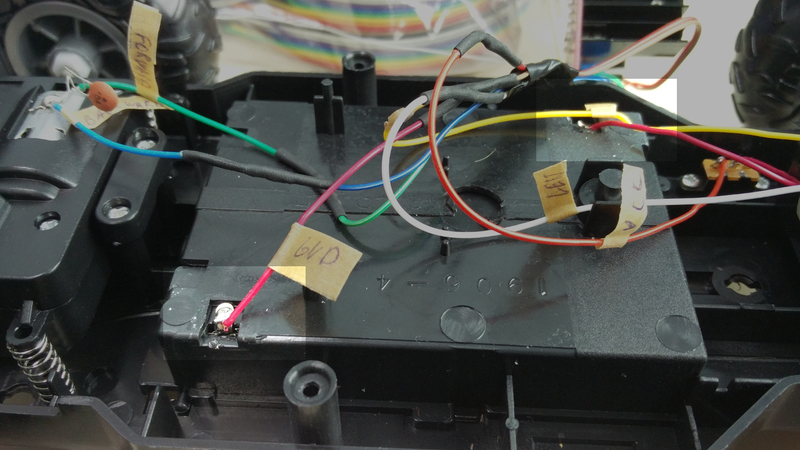 But right here on this car we have this cable connected to the switch and this is the plus of the batteries holder and from there this is the plus of the switch. And this here is the minus.